The sights at Lake Jocassee are legendary. Lake Jocassee is the area's premier lake. Its sights, wildlife and clarity are second to none. Sightseeing is one of the most popular aspects of Lake Jocassee, with its many spectacular waterfalls and the best Fall foliage to be found in the Southeast. Wildlife sightings include Bald Eagles, Peregrine Falcons, Deer, Black Bear, Wildcats and others. 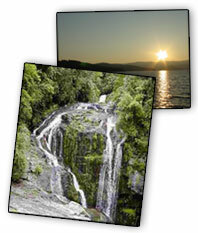 Lake Jocassee also holds state records for Rainbow Trout, Brown Trout and Small Mouth Bass. Known for its clarity, Lake Jocassee is the area's premier freshwater scuba diving location. Call the Store for more Info and for Reservations! Tour covers the entire lake. For larger groups, please call the store for more info on full-boat charters and catering if desired. Full-boat charters can be scheduled for other days/time slots customized to your group's specific needs!